Fierce Blogs: It's a Diamond for Sponge Cola! Sponge Cola once again proved that they are on a league of their own when they bagged the Diamond Record Award for the album, Tambay EP. They now join the elite roster of artists who have reached the same feat of being honored with Diamon Recording Award in the Philippines. To name some of the big artists are Jose Mari Chan, Christian Bautista and Nina (being the first female recipient). On photo below from are the band members Gosh Dilay, Armo Armovit, Sponge Cola’s manager Saul Ulanday, Yael Yuzon, Kathleen Go, and Temark Cruz. For booking and inquiries call 09175337286. 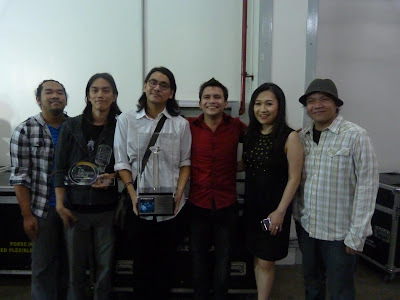 To Sponge Cola and their family, congratulations from Fierce Blogs! We look forward to more brilliant music in the coming years.